You are here: Home 2012 April Cisco Nexus 5500: A Viable Core Switch for the Midsized Enterprise? Mix of Nexus 5500 & Catalyst 6500? Does Nexus 5500 series require a Nexus 7000 parent device? or it will be supported with Catalyst 6509? And FYI, no VSS on Catalyst 6509. —A Q from Cisco Support Community. For years, the Cisco Catalyst 6509 has been the workhorse of small and medium-sized enterprises, used for access, aggregation and core layers. Yet modern CPUs, motherboard chip architectures, virtualization, and more powerful storage arrays are moving the data center performance bottleneck back to the network infrastructure, creating demand for performance that exceeds the 6509. While some might think the Cisco Nexus 7000 would be the obvious replacement, midsized companies could benefit more with a Cisco Nexus 5500, specifically the Nexus 5596UP, as their network core switch. Why not just upgrade the Catalyst with a Supervisor 2T to replace the core switch? With new traffic demands on the Catalyst 6509, one upgrade option is certainly a new Supervisor and line cards to keep the old 6509 fighting. However, those upgrades aren’t trivial expenditures. Plus, it’s well known that Cisco has exhausted the raw forwarding capability of the 6500 with the Supervisor 2T. Why not go with the Nexus 7009 as a core switch replacement? The Cisco Nexus 7009 could be viewed as the natural 6509 successor, as, its form factor is similar to the 6509, allowing for a forklift upgrade without having to allocate additional rack units in the data center. Furthermore, the Nexus 7009 will even mount into a 2-post rack while its bigger brothers, the 7010 and 7018, require a 4-post rack. The Nexus 7K family of line cards also offers high port densities of 10GbE at favorable levels of oversubscription, as well as a migration path to 40GbE and 100GbE. These are all great benefits, but the Nexus 7009 is a pricey bit of gear. Additionally, if an IT shop specifies a pair of the gear to build in the resiliency, then it becomes pricey times two. The list price for a Cisco Nexus 7009 bundle containing 2 Supervisor-1 engines, 5 Fabric-2 modules, and 2 6KW power supplies, the enterprise L3 feature license, and a single Fabric-2 48-port 10GbE line card, totals up to a whopping $157,500. That total doesn’t even include the 10GbE optics that must be purchased. If you add a year of 24x7x4 SNTP SmartNet coverage, that’s another $13,600 to add to the OPEX budget. If the Supervisor 2T and Cisco Nexus 7009 aren’t the right fit, the question then becomes: what is a viable replacement for the Catalyst 6509 that will meet growth demand for 10 GbE ports without busting the budget? The market is replete with choices of densely packed 10 GbE L3 switches from Juniper, Arista, Brocade, HP, and others. However, for a Cisco-centric shop, the Nexus 5596UP could be the answer. The Nexus 5596UP may have a small 2U footprint in the data center, but packs a lot of packet forwarding punch, offers multi-chassis link aggregation and fault-tolerance when configured according to Cisco best practices. Non-blocking at L2: Every port on a 5596UP is capable of forwarding at line-rate, full-duplex without dropping a frame. At Layer 2, it’s theoretically impossible to overwhelm the 5596UP; a frame received is a frame delivered when a switch is non-blocking. Up to 160Gbps at L3 (240Mpps): While not a jaw-dropping statistic, 160Gbps of inter-VLAN traffic is a rather large number for a small enterprise, and not the sort of throughput that most small data centers are likely to approach. While aggregated vMotion, backup and storage traffic could potentially surge beyond the 160Gbps mark, most network designs isolate these sorts of traffic flows to a single VLAN. For example, vMotion traffic doesn’t get routed, therefore doesn’t take a chunk out of the 160Gbps number. Will the Cisco Nexus 5596UP break the bank? From a throughput perspective, the 5596UP sounds reasonable for a small data center application. Yet, does the Nexus 5596UP meet core switch replacement and cost parameters? The chassis, version 2 of the L3 routing engine and the enterprise L3 license, list at a total of $51,800, plus $2,800 to the annual OPEX budget for 24x7x4 SmartNet coverage. Be sure not to overlook that OPEX number for annual SmartNet renewal, as the number is over four times higher for the 7009 versus the 5596UP. Like the Nexus 7009 numbers listed above, this total does not include optics, but note that the 7009 and 5596UP use the same optics. For comparison purposes, the optics cost is a wash.
•As an access-layer switch, it can be used purely as a 1- and 10-Gigabit Ethernet switch, consolidating 10 Gigabit Ethernet connections into a smaller number of server connections trunked to the aggregation layer. •As a smaller-scale aggregation switch, it can be used as a Layer 3 1- and 10-Gigabit Ethernet switch, consolidating multiple 1- and 10-Gigabit Ethernet connections from a data center access layer. •In conjunction with the Cisco Nexus 2248T GE Ethernet Fabric Extender, the Cisco Nexus 5500 Platform can be a high-density 1-Gigabit Ethernet switching system, consolidating more than 900 Gigabit Ethernet connections within a single management plane. 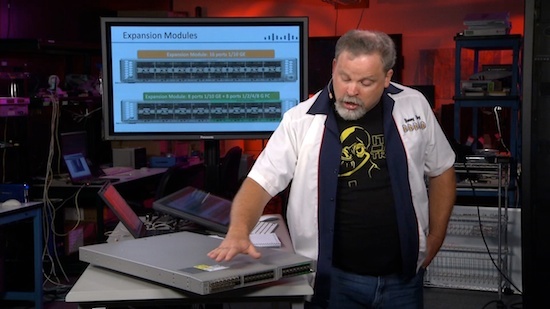 •In conjunction with the Cisco Nexus 2232T 10GE Fabric Extender, it can be a high-density switching system, consolidating more than 600 10-Gigabit Ethernet connections within a single management plane. •As a rack-level I/O consolidation platform, the switch carries Ethernet traffic from servers to the aggregation layer and carries FC traffic to existing Fibre Channel SANs. •As a crucial element in data center I/O consolidation, the switch enables I/O consolidation at the access layer and provides interoperability with the Cisco Nexus 5500 Platform and other standards-based products. Why Cisco 6500 Series is Here to Stay?